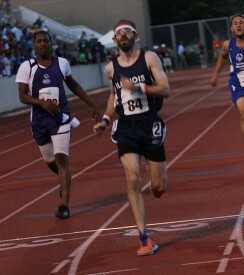 Brent Kampert was one of the 52 athletes Special Olympics Illinois who competed in the 2014 Special Olympics USA Games in New Jersey in June. He won a silver medal in the 100-meter run, 4th place in the 200-meter run and 8th place in the running long jump. 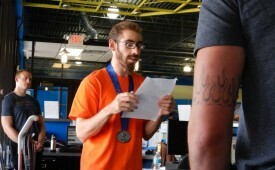 Brent Kampert thanks the staff at Charter Fitness in Crystal Lake for their support. After returning from New Jersey, Brent’s first stop was to see his trainer, Jeff Gardiner. 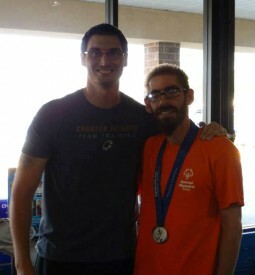 Brent and his family surprised Gardiner with gifts from the USA Games at Charter Fitness in Crystal Lake. When Gardiner walked in, Brent stayed hidden behind his parents before popping out to proudly show off his silver medal. 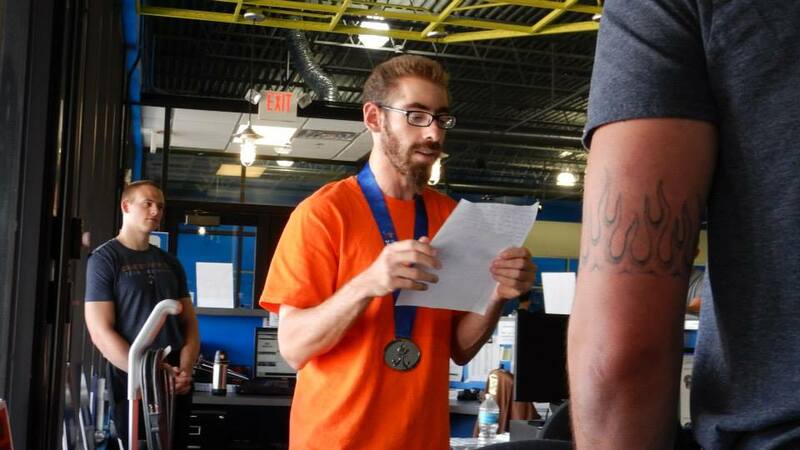 Brent also delivered a speech he prepared himself that expressed his sincere gratitude to the entire Charter Fitness staff for their continued support while he trained. Brent and Gardiner started training together in December 2013, but they had met well before then through a softball league. Gardiner competed in the league and Brent was often around to cheer on friends who played. The two met, and Brent quickly learned that Gardiner, a former professional arena football player, worked as a personal trainer. A few months later, after an extensive interview process with Brent’s parents, Jan and Pat Kampert, Brent and Gardiner were officially in preparation mode for the USA Games. They met three times a week until Brent departed for New Jersey. Over the six months, Brent and Gardiner became incredibly close. Gardiner has become engrained in the Kampert Family. 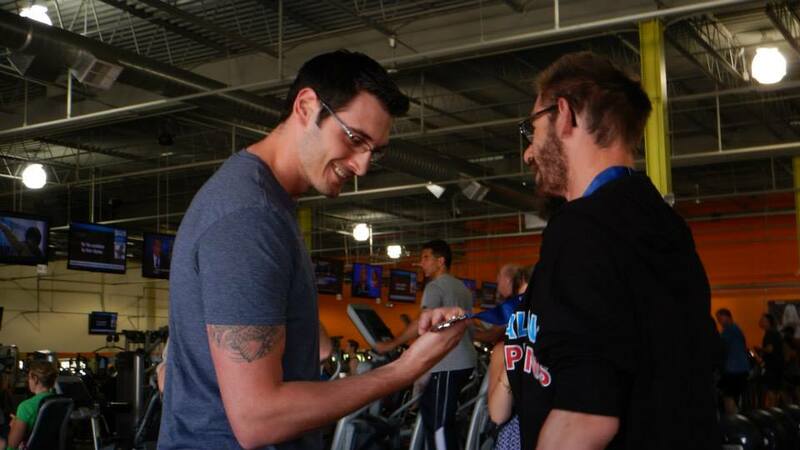 Brent often posted online about his workouts, thanking Gardiner for his help. Gardiner’s own athletic career prepared him for training Brent. “As a former pro football player, Jeff knows the mindset and discipline needed to succeed,” says Pat Kampert. Aside from the physical preparation, Gardiner helped Brent improve his mental toughness and kept him laughing. Gardiner, however, wasn’t the only one giving lessons. Brent has impacted him as well. Gardiner didn’t treat Brent differently than other people he trained. He felt Brent was an athlete and that he needed to be trained like one. While they have concluded their USA Games training, their bond is strong as ever. After exchanging high fives and hugs over Brent’s medal, the pair was already talking about preparations to get Brent ready for the next big competition. “I sometimes wonder if Brent has had a bigger impact on Jeff or vice versa,” Pat says. 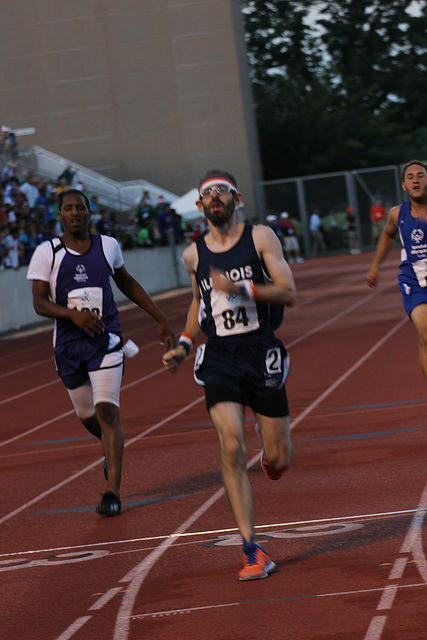 Special Olympics Illinois congratulates all the athletes, Unified partners and coaches who participated in the 2014 Special Olympics USA Games.